Log cabins may be full of rustic charm, but that doesn’t mean that the building materials you choose have to be outdated. Even off-the-grid log cabins tucked away in the mountains can be designed in a manner that improves overall efficiency, in terms of both energy consumption and maintenance requirements. Here are 5 examples of log cabin building materials that are innovative and beneficial to homeowners. Solar panels were first designed in the 1950s, but it wasn’t until the 2000s that they began to be more readily available to the public for residential use. Depending upon the location of your cabin, solar panels could be an excellent addition. The benefits of solar panels largely have to do with saving money on energy bills. The number and size of panels you install, as well as how much sun your log cabin gets, can result in a reduction or even elimination of electrical bills. Another benefit to solar panels is that they not only help to save you money, but they also can even put some money back in your pocket. 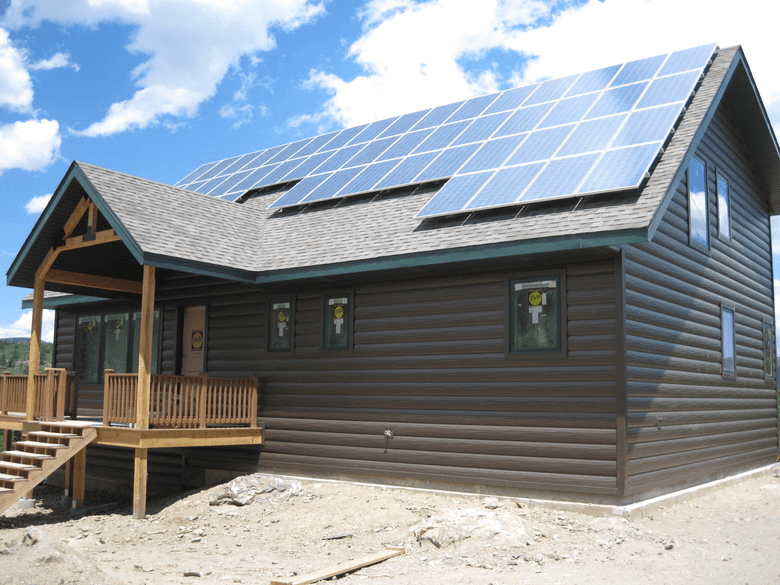 Tax credits and rebates are available for solar powered residences. There are also organizations that offer no-cost installation options for homeowners that don’t have the budget for money-down on a new system. Vertical board and batten siding has a classic farmhouse appeal to it that looks quite beautiful on cabins. Homeowners that love the look of timber cabins, but want something different from logs will find board and batten to be a great alternative. The only issue with timber siding is the inherent weaknesses and potential issues of using real wood. Although it might offer the most authentic look, that’s where the advantages end. Real wood board and batten will need to be regularly re-stained and re-sealed to protect it from moisture. Additionally, living in a rural setting, your wood board and batten cabin may be a tempting home for insects, rodents, and other wildlife. The solution is to use TruLog steel board and batten siding. This combines the aesthetic appeal of wood with the strength and resilience of steel. You will no longer need to worry about expensive and time-consuming surface treatment reapplications. In fact, all you’ll really ever need to do it hose it off when it becomes dirty and inspect it on an annual basis or after severe weather events (i.e. wind storm). 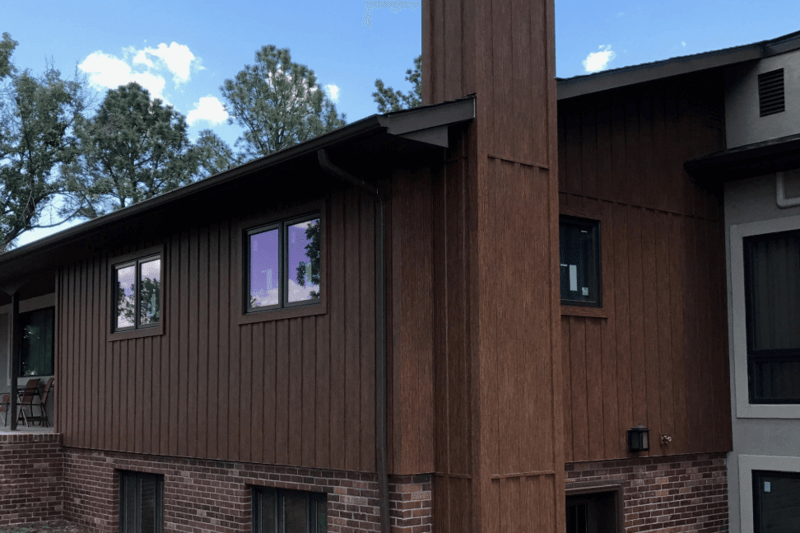 You might be surprised to learn that steel siding isn’t only available in basic flat panels or board and batten, but also comes in a classic log look. TruLog offers steel siding that resembles real logs, including texture and dimensions. Building with actual logs or working with half-log timber is challenging to say the least and can be quite expensive. By using log steel siding you eliminate much of the work during installation and reduce maintenance down to basically zero. 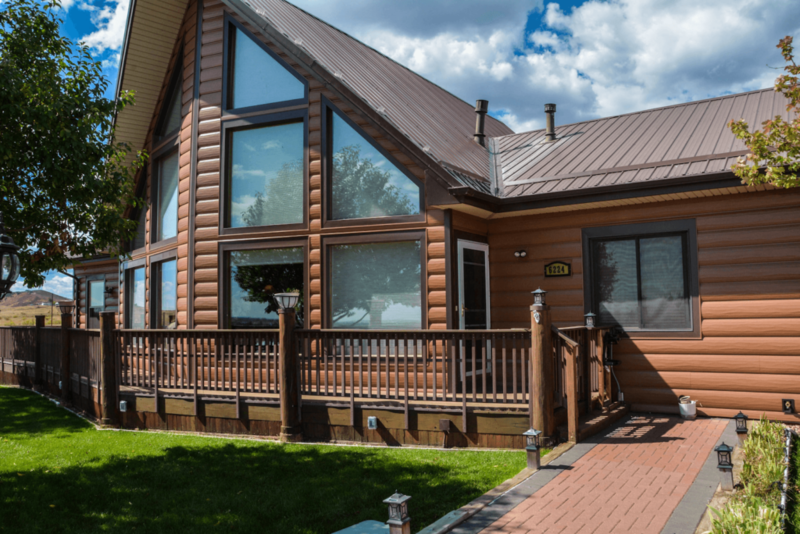 TruLog log steel siding also allows for excellent insulation between the siding panels and the home, without any worries of energy loss through poor chinking. Steel roofs are perfectly adapted for log cabin life. Just like steel siding, steel roofs offer the most protection out of other roof materials, like asphalt shingles or cedar shake. For log cabins located in rural areas or harsh climates, steel will ensure that your home is protected from the elements with relatively little effort on your part. 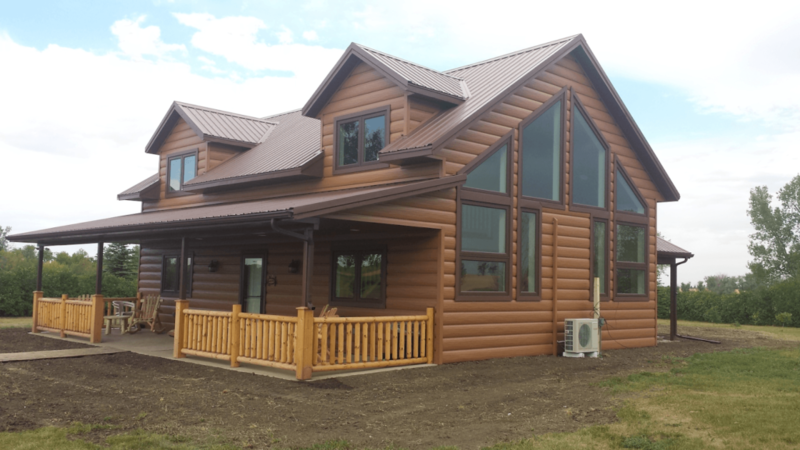 Steel roofing comes in a wide range of colors, including many that look stunning with a log cabin facade. 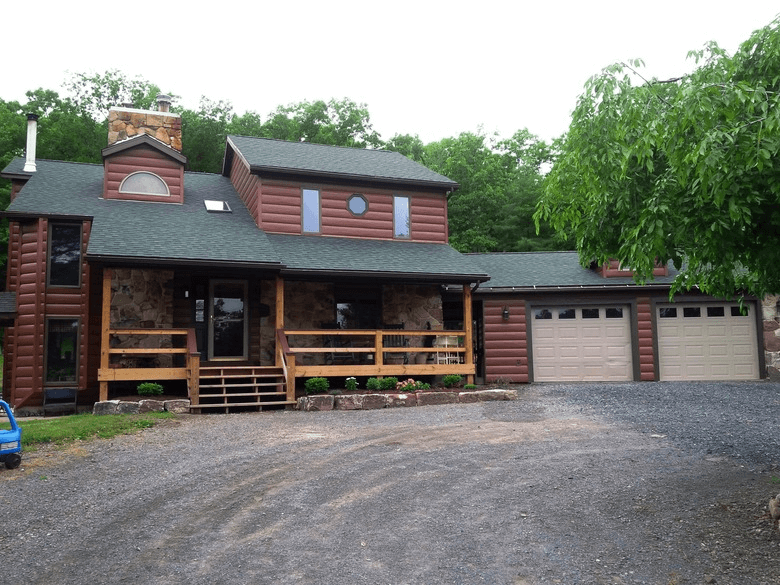 The log cabin in the featured image shows how a standard brown steel roof is quite attractive. Green steel roofs on a natural log cabin is another classic look that is very attractive. Big windows compliment logs cabins well, particularly more modernly-designed cabins. Large windows are useful for letting in natural lighting and can also help to warm your home’s interior when placed on the southern side of the cabin. While you might be able to use reclaimed or recycled materials for your log cabin, don’t be tempted to go cheap when it comes to windows. The majority of issues with improper insulation have to do with poorly-made windows being used. Choose only energy-efficient, glazed windows for your cabin. These can be Energy Star certified or have an equivalent certification. By installing energy-efficient windows you can also be given a tax credit, just like you would with solar panels. 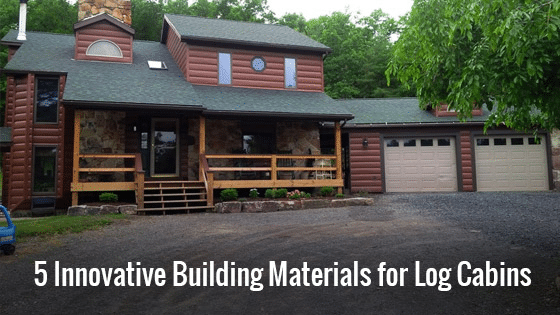 Whether you’re in the process of constructing a log cabin or you’re renovating an existing one, these 5 examples of innovative building materials are all worth considering. Research into solar panels as well as with the use of Energy Star or other energy-efficient windows can easily be done online. Contacting a local roofing contractor will help you determine steel roofing options, including the specific materials they carry. As far as log steel siding, contacting a TruLog representative will get you started on the right path.